Martin (used, 1865 -1898) Model 1-21 Parlor Guitar - Mandolin Brothers, Ltd.
#ISI1947, pre-Martin serial number, in excellent minus condition, with original black pine “coffin” style hard shell case that’s missing its back latches and has but one elegant closure on the front. From the beginning, in 1833, when C F Martin Sr. founded his first business location at 196 Hudson Street in what is now Tribeca area of Manhattan, the pressure stamp logo he used read “C F Martin, New York.” This guitar has that very pressure stamp on the back of the headstock. In 1865, the logo was changed to “C F Martin & Co., New York.” This version of the logo appears on the neck block inside the body (in those days it was stamped upside down) and also is stamped into the back brace with the “& Co.” legend. Consequently we know that it was made between 1865 and 1898 when serial numbering began. As was common in those times, under the top are some initials and what might be a date but because it’s in pencil it’s not especially readable. The reason C F Martin Company continued to state that their guitars came from New York is because they retained a distributor (they called it a sales agency) here, named C. A. Zoebisch & Sons, and also because the cases were black in keeping with contemporary New York fashion. This pine coffin style case, although its lid is loose, has one of the most beautiful (and working) latches on the front and is held closed and secure with an, um, bungee cord. Notable is the fact that on the inside of the lid is an original paper C F Martin label (see photos online) that states the model of the instrument and other Martin information. In those days guitars were smaller; they were usually played in the parlor, on Sundays, after church and before dinner, which in those days was served at mid-day and supper was the small repast taken before retiring in the evening. Being a Size 1 this guitar is 12 ¾” in body width, one size smaller than the modern size O, so in its time this was a decent sized instrument, and in fact larger than many other models. It has the slotted headstock, 12-frets to the body joint and 17 frets total, a neck shape that today would be considered “modified V-shape” and comfortable. The round central soundhole is surrounded by three concentric circles of wood marquetry, two of them 5 plies in wood and the middle circle has a ring of herringbone. Top and back bindings are rosewood with an adjacent stripe of spruce; the backstripe is also herringbone with a spruce purfling. Its sides, back and headplate are, of course Brazilian rosewood; the (probably) ivory nut appears original but the already replaced bridge and its later saddle have been replaced by our own illustrious Leroy Aiello. This majestic instrument shows normal signs of use including scratches, dings, indentations, chips, scratches and scuffs but it has no cracks and that is a cause for celebration. There are some minor chips out of both sides of the headstock. 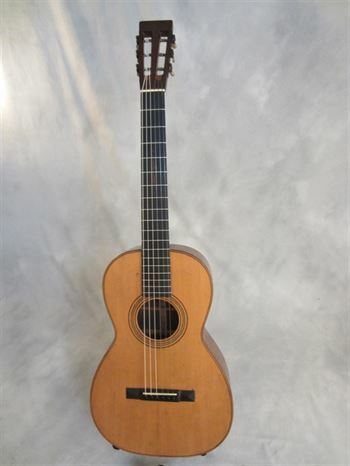 Because we have replaced the already replaced bridge plate this guitar plays quite comfortably with the nylon strings that are on it, but there is a good chance that it it might also take John Pearse phosphor bronze silk-and-steel strings. Although Style -21 guitars are not now bestowed with a carved diamond dart behind the neck, in this early period they were provided this decorative fillip. The original tuners are located in a baggie in the case pocket, but, since one shaft and button on the ivory buttoned tuners, which are beautiful and elegant was missing we have chosen instead to locate and provide another set of pre-1900 parlor guitar tuners whose shafts fit the same holes. Mr. Aiello has dutifully performed his death-defying neck reset and bar-fret refret, so it now plays beautifully. This is one of the nicest examples of a Circa 1865 Martin 1-21 Parlor guitar as we have recently offered for sale. It is a guitar that would be devoutly wished for by any collector, but also by any player who leans toward the gentle music of the age of Stephen Foster or Louis Moreau Gottschalk. This instrument cannot be purchased online at this time. Please call or email for more information, or submit a purchase inquiry now by clicking the button below.